Hello... Thank you visiting my website. 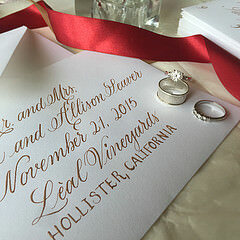 I'm Nickki Honeycutt the Calligrapher and Owner behind Amore Paper and Ink. My goal is to make your event / wedding the best you imagined with handwritten envelopes, vows, place cards and table cards. Whatever the occasion, a handwritten envelope or place card shows that you care about every detail, that no detail was over looked and that every guest is important! Please take a look around on my website and if you like my style, email me to discuss the details of your event. I'm always happy to help.